Have you ever tried to make lifestyle changes but had difficulty following through? Imagine what it would be like to get up each morning with energy, clarity and motivation to tackle the day. If you want to get past limiting barriers that are preventing you from being your best self and living your best life, tune in to Transformation Talk Radio and join holistic health and wellness coach T. Kari Mitchell or visit lifestyle120.com now for information about how you can receive the personal attention you deserve. T. Kari Mitchell is a former classroom teacher and school administrator. Her lifelong passion for wellness sparked a desire to become a holistic health and wellness coach in order to empower others to achieve their wellness goals. T.K. received her B.A. from Scripps College, her M.Ed. from University of Southern California, her Health Coach Certificate from Institute for Integrative Nutrition and her Ageless Grace® Certificate from Ageless Grace®. T. K. has been health conscious most of her life, but each decade has presented new challenges, discoveries and insights on her journey to maintain lifelong wellness. After being diagnosed with multiple food allergies, her life dramatically changed. Through dietary modifications and lifestyle interventions, she was able to reverse several health challenges. Now she enjoys preparing delicious and nutritious meals using alternative ingredients. As founder of Lifestyle 120, T. K. is deeply passionate about helping others transform their lives through lifestyle choices. T. K. is convinced that nutrition and lifestyle significantly impact overall health, happiness and well-being. 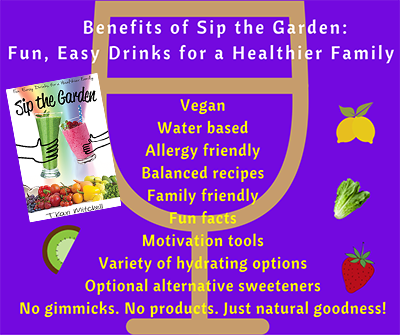 T. Kari Mitchell is the author of Sip the Garden: Fun, Easy Drinks for a Healthier Family. Sip the Garden is a collection of delicious plant- and water-based beverage recipes that offer families one positive, manageable lifestyle change that will improve overall health. The book shows families how to cut back on soda and other sugary drinks the easy, nutritious way. Besides writing, T.K. enjoys traveling, keeping fit, creating gourmet recipes, attending live theatre and jazz performances, and taking piano lessons. Her motto is live, learn, love, grow and be a blessing to others. T. K. was raised in southern California and currently resides in the Chicago area. To find out more about T. Kari Mitchell and Lifestyle 120, please visit lifestyle120.com. Are you and your family looking for ONE manageable lifestyle change that will positively impact your health? Look no further. Junk Food Junkie No More, by T. Kari Mitchell, a fun lyrical play encouraging youth to make healthy lifestyle choices. Performed by participants of a summer program for youth.